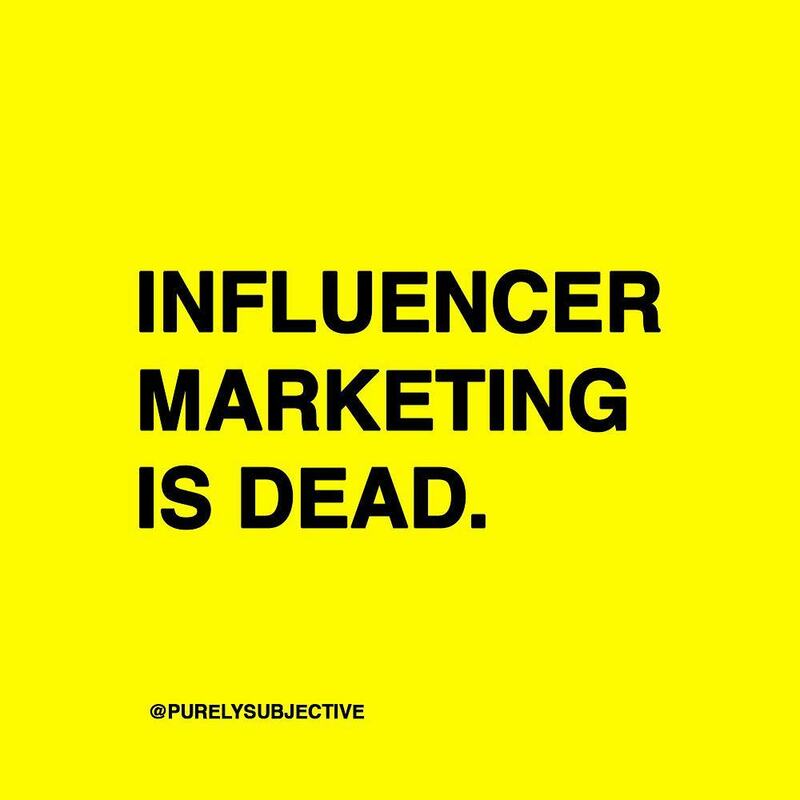 Purely Subjective .002 - Influencer marketing is dead. #Ad is a turnoff. Finding the humility to happily walk away from those that don’t get it unlocks our ability to do great work. Influencer marketing is dead. #Ad is a turnoff. Consumers are tired of the fake and no one knowingly wants to be lied to — unless you’re Ja Rule. In the wake of #FyreFestival, the fraudulence of glitz and glam have lost their sparkle. 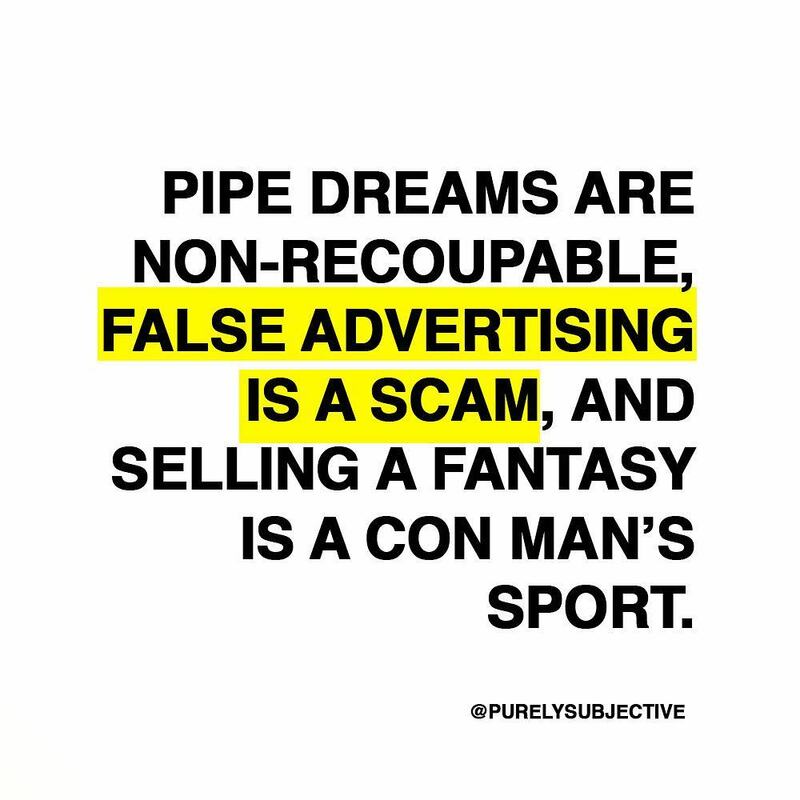 Pipe dreams are non-recoupable, false advertising is a scam, and selling a fantasy is a con man’s sport. Paid placements in front of large audiences with no substance for them to revert back to provide nothing but diminished returns. Do you even care that your ROI is negligible? Veer away from old-school awareness plays disguised as marketing tent-poles and focus more on making original content to grow your own genre-specific community. Level up and sell access. Develop a strategy and launch a portal filled with deliberate offerings worth revisiting. Things that can’t be unseen: Chance The Rapperas a Backstreet Boy IRL. Reclaiming my time: Being the bigger person is a scam. The whole concept of behaving with magnanimity is overrated if it means allowing people to walk all over you — or in the case of Lorena Bobbitt, allowing the retaliatory actions to your husband’s abuse haunt you (for decades.) When in a bad situation, it slowly strips away hope, joy, and access to your vision. You start feel as though you’re suffocating from circumstance. Being the bigger person is not the hill you die on, though these environments are conditioning your body to survive at higher altitudes. Faith in hard times tests your lung capacity. Take the necessary time to build the strength and ability to withstand and survive in every room. Facebook has been putting spyware-like software on consumer phones, and Apple decided to pull the plug on the not-so-friendly giant. Amazon is going for the gusto when it comes to DTC and original products, yet despite the prime opportunities burgeoning brands aren’t biting. It’s not even Sunday, yet Cardi B has already won the Superbowl. The world of gaming is the next frontier, watch these five tech titans scramble to become the ‘Netflix’ of video games. Hip-Hop sales are steadily in the decline, but urban marketing professionals don’t mind the weather. On my mind, and in my heart: The first time I went to SXSW, Mac Miller and I were too young to get into any venues. Different showcase promoters had to respectively sneak us in so the club owners wouldn’t question our ages. Moments like this remind me of the innocence of those times. Will forever remember him fondly. Get this newsletter in your inbox, semi-regularly.Subscribe here. Follow along on Instagram: @PurelySubjective. Previous Post Purely Subjective .001 — Unfollowing all your friends on Instagram is not marketing.